Republican women have faced a conundrum repeatedly in the last two years. In the cases of Donald Trump, Roy Moore and Brett Kavanaugh, the question facing them has been whether to support a male Republican leader accused of sexual assault — or to press for male accountability. 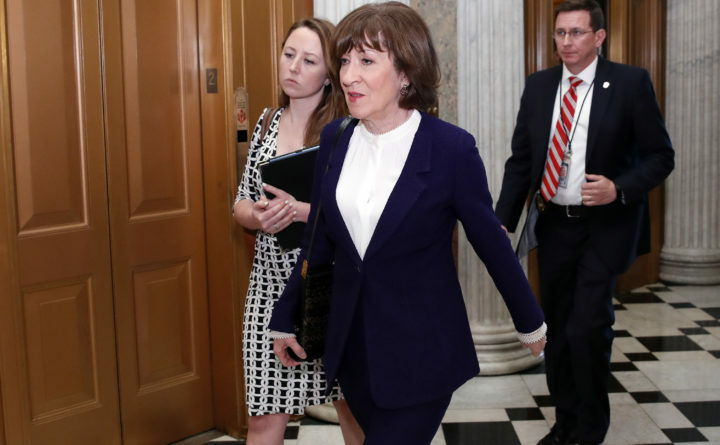 That was evident most recently when Susan Collins, the Republican senator from Maine, spoke for 45 minutes on the Senate floor earlier this month. Collins explained why she voted to confirm Kavanaugh to the Supreme Court despite multiple allegations of sexual assault against him. The length and detail of her speech reflected her quandary. If she voted no, she would disappoint her fellow Republicans. If she voted yes, women might see her as a gender traitor, one who did not, as a popular hashtag describes, #BelieveSurvivors. Research for our book, “Nasty Women and Bad Hombres: Gender and Race in the 2016 US Presidential Election,” leads us to believe, however, that many Republican women aren’t asking whether they should leave the party. The number of women who identify as Republican has declined over the last two years from 27 percent in 2016 to 25 percent in 2017. But we believe it would be wrong to expect, in this political moment, a mass exodus of women from the GOP. In fact, 52 percent of white women in 2016 cast their vote for Trump. That was despite the 22 allegations of sexual misconduct against him. Moore got 63 percent of the white women’s vote in the 2017 Alabama Senate race, despite the sexual misconduct allegations against him. And Republican women were the only demographic that increased its support for Kavanaugh during the hearings of sexual assault allegations during his confirmation process in October. Our research led us to conclude that Republican women will mainly stand firm in their party affiliation. They are loyal to the party, even if political moderates and those who identify as the progressive left have concluded that the GOP does not respect women’s voices and bodies. But does this mean that Republican women consciously accept second-class status when they stand up for their party? It’s true that Republicans do not tend to identify as “feminists.” A Pew Research Center poll conducted in September and October found that only 14 percent of Republicans said that the term “feminist” describes them well, compared with 60 percent of Democrats. However, we have found that Republicanism encompasses different visions of womanhood that allow women to feel that they can be Republican and also strong women. White men lean heavily Republican and white women are more likely to be married than black and Latino women and still most often marry white men. This in part accounts for white women’s greater likelihood to vote Republican. 2) For these white women Republicans, their concern for their husbands’ and sons’ welfare may lead them to stay with a party whose leaders prioritize the economic interests of those men. Donald Trump’s campaign promised good-paying jobs in traditionally male sectors of the economy — mining, manufacturing, policing and the military. That promise would have appealed both to men and to the women who love and support them. 3) Longstanding cultural models have encouraged women to establish their self-worth through care for their family. The notion of benevolent patriarchy allows conservative women to feel that if they submit to their husband’s wills, they can benefit through their husband’s protection and economic care. This may influence their political choices as well. As a contributor to our book, Mark Ward, writes, evangelical Christian churches have long encouraged wives to embrace the role of helpmate and mother within a patriarchal household. Ward notes that Hillary Clinton forever found herself on the wrong side of evangelical Christian voters after her 1992 remarks in which she explained that, “I suppose I could have stayed at home and baked cookies,” but she chose to pursue her profession instead. These comments were interpreted as dismissive of the traditional role of the housewife and mother. Popular culture has generated a spate of strong female characters who defend themselves and others. Fewer women, it seems, want to identify themselves as genteel cookie bakers. As more women have been elected to office, they have evolved new images of femininity that could encompass motherhood and also female leadership in the traditionally male realm of politics. These new images of femininity are another avenue through which Republican women like Iowa Sen. Joni Ernst, New York Rep. Claudia Tenney, former Minnesota Rep. Michele Bachmann and former Hewlett-Packard CEO and presidential candidate Carly Fiorina can stay true to their party while asserting their own power. For instance, in 2008, vice presidential candidate Sarah Palin set the example of the strong Republican woman who could raise five children, maintain a professional career, and hold her own in the combative world of politics. She called herself a “hockey mom” and “Mama Grizzly” who would protect her cubs at any cost. During the Kavanaugh confirmation hearings, Trump provided a culturally acceptable “out” along these lines for conservative women who wanted to support the Republican judge but worried that doing so might be seen as a betrayal of female survivors of sexual assault. Consider what happened in North Dakota. Although Heidi Heitkamp of North Dakota is the most vulnerable Democratic senator up for re-election in 2018, she voted “no” on Kavanaugh, which was likely to cost her in a state that had voted for Trump in 2016. And #MeToo activists — according to Cramer’s family — are not as “tough” as the North Dakotan “pioneers of the prairie.” This language implies that, even if women are sexually assaulted, they should bear up under it. In the upcoming midterm elections, Republican women who want to see themselves as strong, while supporting a party that has excused male sexual assault, can add the “Prairie Woman” vision of feminism to the “Mama Grizzly” identity of strong women. In so doing, Republican women are constructing their own version of womanhood that does not eclipse — or hold to account — the dominant position of men in their lives. In this vision, women can hold their own — against feminists on the left as well as male sexual predators. This model of “prairie woman” femininity shows there is diversity in how strong women act. At the same time, it precludes gender-based solidarity by rejecting any possible alignment with feminists on the left who hold offending men to account, and who demand change within a culture that devalues women’s experiences overall. Christine A. Kray is an associate professor of anthropology, Hinda Mandell is an associate professor and Tamar Carroll is an associate professor of history at the Rochester Institute of Technology. When will this ungodly episode in American history end?